, (that is understanding what is the UNIT of the group of elements we are working with) is well understood. 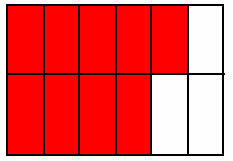 The concept of partitioning goes along with it. 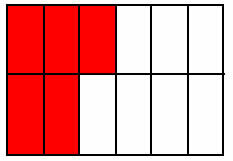 The unit is defined by the denominator (the bottom number). The rules goes that you cannot add apples with oranges! you cannot add fractions with different denominators! Do you see? 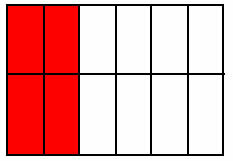 the units (the denominators) which we used to divide our rectangle are different! 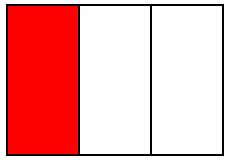 How can we add the two fractions? Instead, we must first find a common ground to work on. In Algebra, this is found through the Least Common Denominator. So the following step lead us to "create" this common ground with a simple trick: to find the smallest common multiple of the two fractions and change the original partitioning where necessary. Ahh! Now we can proceed adding fractions! Easy! So, mind the bottom numbers (the denominators)! Are they the same? If positive just add the top numbers together and leave the bottom numbers as you found them! which he is following. DE MORGAN, A.